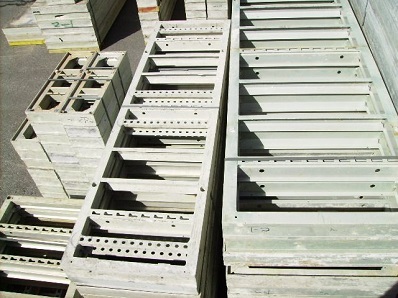 DOKA FRAMAX Wall Forms Large inventory of DOKA Framax forms & hardware has just now become available 1/2/2019 for purchase, all in good condition. There is a wide variety of sizes available at VERY GOOD pricing. Please reach our Sales Department for details & delivered pricing. DOKA Framax Xlife the crane-independent variant of DOKA Framax forms Xlife DOKA Framax Xlife is a complete system with high-performance safety and working accessories. The panels are lightweight and handy, and so can be quickly erected by hand. The system uses only a very few different sizes of panel to obtain a consistent 15 cm increment-grid. The connecting devices and accessories are also designed to fit in with this increment-grid. The innovative plastic coating of the Xlife sheet enables it to be re-used intensively, with superb concrete results every time. DOKA Framax forms Xlife is ideal for use on walls, columns, circular formwork and foundations A range of practical accessories makes work on the site a lot easier and does away with the need for costly in-situ improvisations. DOKA Framax Xlife is 100% compatible with Doka framed formwork DOKA Framax Xlife. All the linking parts, closures and accessories are interchangeable of course. With DOKA Framax Xlife, you can form large areas with crane-shifted gangs, and then continue forming manually with DOKA Framax Xlife, without having to wait for the crane. Forming walls with DOKA Framax forms Xlife With the Doka framed formwork DOKA Framax Xlife, you can achieve perfect forming results even without a crane. The exceptionally high load ability and long lifespan of DOKA Framax Xlife make DOKA Framax is unusually versatile and flexible, so you can quickly form any layout with it. The panels can be fixed together at any point around the frame, quickly and safely, using the Framax quick-acting clamp RU or the multi-function because the DOKA Framax Xlife panels are so robust, you only need 2 form-ties per 2.70 m of panel height. Any fitting-gaps left between the DOKA Framax Xlife panels are very easy to close. The system gives you a choice between several different options so that you can always get the best possible length adjustment in each case. DOKA Framax Xlife also takes corners, stop-end formwork and wall junctions happily in its stride. Here too, it gives you perfect, cost-saving solutions. Matching safety and working accessories make work with DOKA Framax even quicker and easier. Clean concrete surfaces with the innovative Xlife sheet The Xlife sheet consists of a combination of a traditional plywood core and a novel and innovative plastic coating. This combination of materials ensures high numbers of repeat uses, with superb concrete results every time, and reduces the proneness to damage. High quality concrete finish Less touching-up needed Less cleaning work - the Xlife sheet can also be cleaned using a high-pressure spray cleaner No breaking away of plywood chips, and less water is absorbed through nail-holes Screwed-on from the rear, so no screw marks.